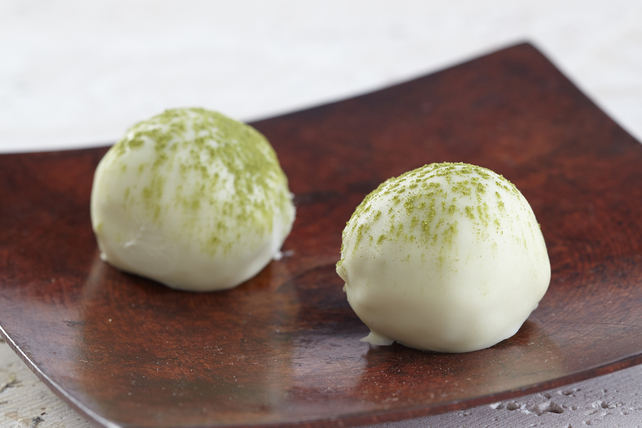 These Matcha Cheesecake Truffles are delectably delicious. A white chocolate coating surrounds a creamy filling for a gorgeous edible gift. Beat cream cheese and butter in large bowl with mixer until creamy. Add graham crumbs, sugar and 2 tsp. tea powder; mix well. Scoop cream cheese mixture into 28 (1-inch) balls, using about 1 Tbsp. cream cheese mixture for each ball. Place on parchment-covered baking sheet. Freeze 10 min. Melt chocolate as directed on package. Dip cream cheese balls, 1 at a time, into melted chocolate, turning until evenly coated with chocolate. Return to baking sheet; sprinkle with remaining tea powder. If necessary, re-roll each partially frozen cream cheese ball into round ball before dipping in the melted chocolate. Since the cream cheese balls will soften quickly at room temperature, remove them from the freezer in small batches before dipping in chocolate as directed. Use a small cookie scoop to evenly portion the cream cheese mixture for each truffle.